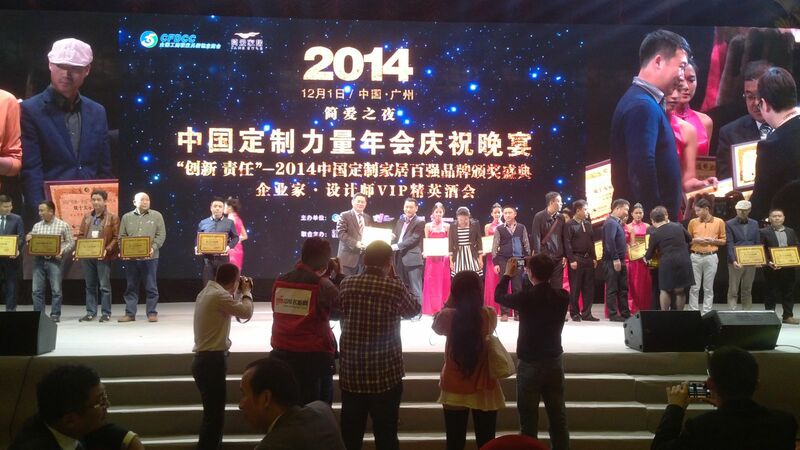 Fadior Awarded as "Modeling Brand for Chinese Custom Furniture Industry"
December 1, 2014, Chinese custom furniture industry annual meeting was held in Guangzhou which was host by CFDCC. This annual meeting is the domestic large-scale, high specification, generally recognized by the industry's premier annual top carnival. 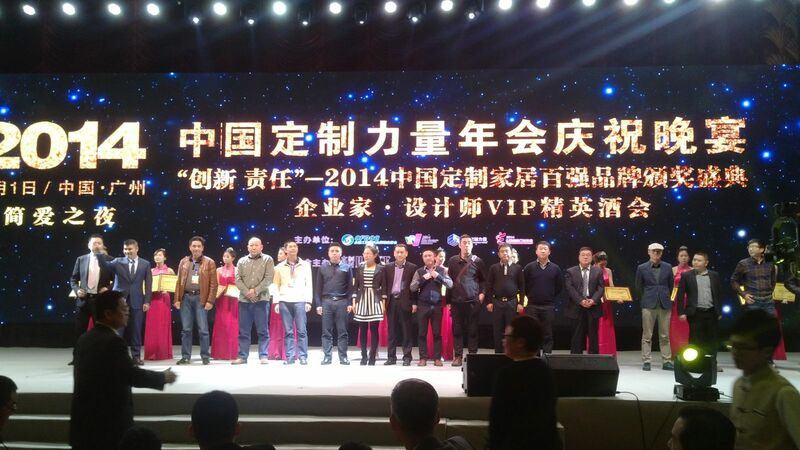 Government leaders, enterprises, designers and media gathered together and discussed on the theme of "cultural industry, custom life". 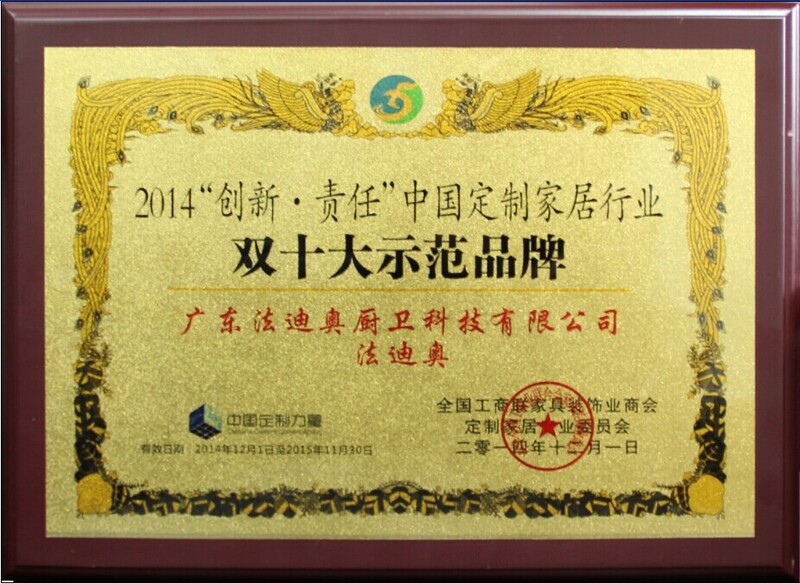 Fadior Stainless Kitchen Cabinets with excellent products and eco-friendly design, highly recognized by the industry and customers , was awarded as 2014 "Modeling Brand for Chinese Custom Furniture Industry" Chinese custom furniture industry "double Top 10 demonstration brand". This is the industry and consumers are highly affirmation of Fadior stainless steel cabinets insisting on innovation and originality , health environmental responsibility , promote healthy lifestyles high quality home tireless efforts and contributions. "Double Top 10 Demonstration brand" not only represents the basic requirements of China's domestic industry for product innovation, environmental health, quality of service of great importance, but also the basic requirements of the development of the industry. Protect environment; let the consumer to use health and safety products is each enterprise's social responsibility. Global available forest resources increasingly scarce, according to statistics, in 2014 only 21.63% forest coverage in China. Forest trees growing deforestation, timber resources are increasingly depleted, serious soil erosion, sandstorm, fog haze, extraordinary global warming... Use less wood is less every responsible enterprise should do. Wooden furniture "formaldehyde" excessive, has been the biggest drawbacks harm consumers. In order to completely change the industry's environmental protection issues, Fadior has been committed to creating high-end home life, respected environmental health environment, lapping Stainless Steel Kitchen Cabinets for more than 20 years, master the various characteristics, conquer stainless steel difficult processing problems, with a number of exclusive patent innovation technology become core stainless steel ambry industry leader, creating the world's first non-formaldehyde safety cabinets, push out green environmental protects, security worries products and sell well in Australia, Africa and the Middle East, invited the global elite to enjoy the quality of permanent non-formaldehyde health cupboard. In the future, Fadior will make persistent efforts, excellence in quality, with the innovation of science and technology made twenty-two big luxury quality assurance, continuously overstep perfect classic designs, provide the most respected service for customer. Fadior, as the stainless steel cabinet industry's reputation leader enterprises, more than just create the kitchen, is a model of noble life quality, become the standard of leading home industries into global high-end safety times, made a great contribution to promote the innovation of China's cabinet, safe and environmental protection comprehensive development and contribution!